The earliest explorers and settlers in central New York first used ancient Indian trails to enter the region. Over time, primitive dirt roads, plank roads, and turnpikes and the navigable portions of the Susquehanna River and its tributaries greatly aided expansion into the lands southwest of Albany. Eventually, the broad gauge Albany & Susquehanna Railroad - a predecessor of the powerful, renowned Delaware & Hudson Railroad - formed what would be regarded as the ultimate link in the transportation system that connected Albany with Binghamton. In accelerating community growth, the railroad spurred the development and facilitated the growth of local industry - limestone and cement, dairy and agriculture, and the manufacturing of tools, wagons, wood products, and machinery. In his inimitable style, Mr. Taibi engages the reader on a point-to-point tour, weaving an entertaining story around how these three phases of passage - the Roads, Rivers, and Rails - created lifelines for the interior towns. This book contains more than 500 color, sepia, and black & white illustrations - from vintage stereoviews of A&S/D&H operations to 2011 color photographs of current owner Canadian Pacific Rail with Norfolk Southern operations via trackage rights. Early D&H steam and the most modern diesels - AC4400CW, SD60, SD90, ES44AC, C40-9W, and ES40DC - are shown at various locations. Union Pacific run-through power is also included. Among those places visited in this first installment of Roads, Rivers, and Rails, are Voorheesville, Altamont, Delanson, Cobleskill, Richmondville, Worcester, Schenevus, and Oneonta. Volume II will begin the story anew at Oneonta and continue on to Otego, Unadilla, Sidney, Bainbridge, Afton, and Nineveh - concluding at the "Parlor City," Binghamton. 238 pages, 523 illustrations (over 200 in color), maps, blueprints, bibliography, complete index. Oblong hardcover. Gloss film lamination. Printed on American-produced 80# gloss enamel paper. When most bankrupt Northeast railroads were united into one company, Conrail, the USRA was aware that the region needed some competition for 'Big Blue.' The only independent railroad ready to take up the challenge of expanding into Conrail's territory was the fabled Delaware & Hudson. Follow its struggles to compete in this new environment from 1976 until it too was caught up in the financial malaise and vanished in 1991. The Delaware and Hudson Railway has a grand and glorious history that began in the coal mines of Pennsylvania. The Delaware and Hudson Canal; Gravity Railroad; the Stourbridge Lion, the first locomotive in America in 1829; and the Albany and Susquehanna Railroad provided the necessary stepping stones for successfully transporting anthracite by rail to New York State. In 1906, the massive roundhouse was built in Oneonta during the glory days of steam power, and in 1931, the company became known as the Delaware and Hudson Railway. Today the railroad serves as a "bridge line," providing an important link in moving heavy freight. Delaware and Hudson Railway enlightens rail fans with historic photographs and rekindles the nostalgia for the great railroad era. Organized by geography, starting at the northern end of the railroad in Canada and ending up at the southern end of the line in northeastern Pennsylvania. The authors stick to the 744 mile system the D&H operated before 1976, with only a few diversion to add to the story of the railroad between the 1950's and the beginning of the Guilford era in 1984. A limited-edition book with more than 150 color photos. High gloss, heavyweight paper. I often find myself browsing various railroad books on subjects where I have a passing interest, and wouldn't mind learning a little more. Since I am not familiar with the subject matter first-hand, will the book be of value to me years down the road? With this particular book, there was little question! The publishers of Railroad Explorer Book Cover have brought forth an amazing offering for both the Delaware & Hudson fan and the passenger train fan. 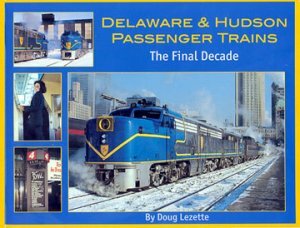 Carefully authored by Doug Lezette, Delaware & Hudson Passenger Trains: The Final Decade is a well-detailed account of the late streamliner era on The Bridge Line. If you enjoy passenger trains, you are probably interested in the era leading up to the formation of Amtrak. In a time when most railroads could not wait to escape the burden of providing passenger service, the Delaware & Hudson was looking to improve their existing trains and entice more people to ride. For years, D&H trains were a simple mix of everyday heavyweights with streamlined parlors and coaches from the connecting New York Central. The new president of the D&H, Frederic "Buck" Dumaine, formerly president of the New Haven, was responsible for the major changes to come. 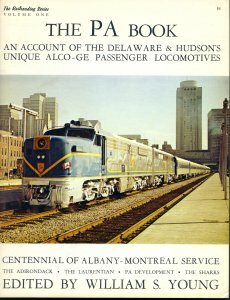 By the late 1960s, the only remaining D&H service was between Montreal and Albany, with through connections to Grand Central Terminal. In 1967, D&H acquired several surplus streamlined cars from the Rio Grande to re-equip its Laurentian and its Montreal Limited. In late 1967 the first new equipment arrived, but continued to be pulled by the existing steam-equipped RS-2's. This certainly would not do! In December 1967, four PA-1's were purchased from the Santa Fe, plus a fifth from the New Haven that was used for parts. The famous Alco PA era on the D&H had now begun. The Final Decade covers each era with carefully selected photos and detailed captions. Each chapter explains a period of train development along the way, from the late 1960s, through the excursion era with president Bruce Sterzing and the Sharks in the 1970s, to the rebirth of Amtrak's Adirondack in 1975, to the disposition of the equipment in 1979. Interesting is the story of the development of the Adirondack, and D&H's prominent role in operating the train. Amtrak was so desperate for equipment and an operator that they conceded to the railroad on many points. Trains were often staffed with D&H employees in D&H uniforms. Sterzig once scrambled to staff the dining car with D&H office employees after Amtrak pulled their staff. Also noted in the infamous 1975 "Who painted the dome car?" incident. To the dismay of railfans everywhere, Amtrak re-equipped the train with Rohr turboliners before all the D&H equipment came back from rebuilding. Sadly, not much of the trains survive today. The original Rio Grande cars were sold to Venezuela. The Adirondack cars, rebuilt with NYSDOT funds, were used on MTA commuter lines (former Penn Central Hudson and Harlem Lines) until 1984. Sadly, most of the cars were the victims of arson while in storage in Grand Central Terminal. The PA's were sold to Mexico after a brief stint as freight power, and as commuter power for MBTA. Two shells of the PA's have returned to America for cosmetic restoration. Thirty-six individual photographers contributed to this book, including Jim Shaughnessy, Jim Odell, Jeff Martin, Gardiner Cross, Len Kilian, and Kip Grant. The author also interviewed former D&H president Bruce Sterzig; as well as Peter Dillon, one of the former dining car crewmembers. Lezette's thorough research and attention to detail in preparing this book is evident throughout, and the color reproduction is fantastic. The book is easy to read, presented in an attractive format. I personally think that the map artwork is very handsome, but I may be somewhat biased. I learned so much from this book on a subject I thought I was already pretty familiar with. This is one of the most enjoyable railfan-subject books that I have come across in a while. Whether you are just a casual fan, or you bleed blue-and-yellow, this is great book that is full of informative personal accounts and great photography that you will not want to miss. Smokin' ALCO's, powerful U-boats, flashy Geeps that the D&H was famous for, all in full Color! From Albany to Allentown and beyond, you'll see pushers on Belden, action on the Penn Division, run-through freights along the Lehigh and includes index. This beautiful all-color book "Delaware & Hudson: Thunder & Lightning Stripes" covers the D&H from the 1970's to the 80's. Spectacular color photography in the Northeast includes places like Binghamton, Oneonta, Starrucca Viaduct, Mechanicville, Scranton, Wilkes-Barre, Allentown and more! Classic motive power includes Delaware & Hudson Century 420's, C424's, RS3's, RS11's, RS36's, rare PA1's and Baldwin Sharks, U23B's, U30B's, U33C's, GP38-2's, GP39-2's, and more! 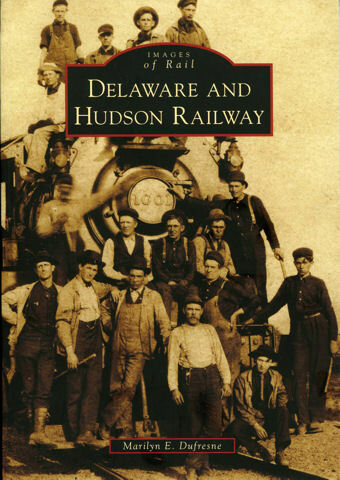 This soft cover book contains vintage photographs of passenger equipment and car rosters for the Delaware and Hudson Railroad. 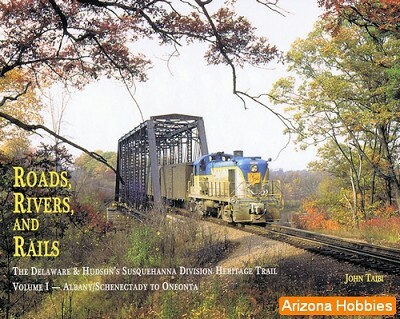 This book is a must for all modelers and fans of Delaware and Hudson Railroad passenger trains! Cars are shown in several different paint, striping and lettering schemes. A complete roster and index accompany crisp clear black and white photos. These vintage photographs are run large so you can see all of the details! This is the first in a series of D&H equipment. Publisher: Morning Sun Books, Inc.
Chuck Yungkurth's new book is a wonderful blessing to those of us who aren't old enough to remember steam locomotives on our favorite railroad. It includes a surprising variety of shots by Bob Collins and Henry Peterson, plus contributions from seventeen others. Some of the pictures have been published before; most have not. Since all the photos are in color, nearly all date from the late 1940's to the end of D&H steam in 1953. There are four shots of the Reading 4-8-4 that was "D&H-ified" for the 1973 Sesquicentennial. Yungkurth, who grew up in Scranton and lived near Binghamton for decades, has included useful photos documenting both the railroad's connection with anthracite mining and some of its steam-era freight cars and cabooses that still exist. As for geography, the Pennsylvania Division is covered particularly well, featuring pusher operation over Ararat Summit. There are several fine scenes in and near Whitehall and at Lake George. Yungkurth's text is as good as the photos, and I learned a great deal from it. In my opinion, the book is worth every penny. Hot on the heals of the last Morning Sun Books, Jim Odell and Len Kilian have produced a gem of a book to expand on the passenger equipment of the D&H Color Guide. The book is largely from the collection of photographs taken by Gerrit Bruins produced between the years of 1949 to 1974. Gerrit has captured many unique photographs of rare equipment around the Albany area, compiled and captioned by Jim Odell and Len Kilian, both BLHS members. The book starts with a short biography of Gerrit's life and his desire to capture passenger trains through their golden years shortly after World War II through the creation of Amtrak. 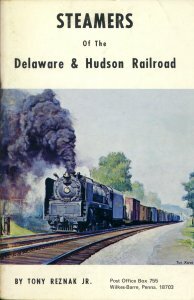 Following the biography, the book continues with a large section on New York Central Passenger trains, then a section on the Delaware and Hudson followed by small sections on the B&M and Rutland. This freshly-minted book is an indispensable reference for anyone interested in the freight and passenger cars used by the Delaware & Hudson from the 1950's through the 1980's. BLHS members Jim Odell, Jeffrey Martin, Gardiner Cross, and Jack Wright have performed an invaluable service by putting the book together, using slides taken by approximately fifty photographers, most of them BLHS members. This volume provides abundant evidence of the incredible variety of painting and lettering schemes that the D&H used on its equipment. Understandably, given the book's all-color format, rolling stock painted in the 1960's and later is better represented than cars in earlier liveries. There are, for instance, no photos showing the pre-1953 pattern featuring a tiny road name just underneath the D&H reporting marks, sometimes accompanied by the small, circular ``A Century of D&H Anthracite Service'' herald. Only a few shots show the 1953 version, with a small road name and the circular Bridge Line herald. Several photos show the circular herald accompanied by the large, billboard road name; I still think the large name wasn't used until 1956, not 1953. The authors, however, have taught me a lot, notably the dates (months as well as years) in which the D&H painters started and stopped certain practices, such as painting the ends of yellow boxcars yellow instead of black. Most of the photos are so well reproduced that a fanatic can use a good magnifying glass to read a great deal of the data painted on the cars shown. Practically every sort of steel car the D&H ever used is pictured in this book. The only exceptions I'm aware of are, as noted in the book's introduction, some passenger cars used for excursion service during the Sterzing years. Wooden passenger cars, whose further use in passenger service was forbidden in 1956, are shown only in company work train service. (Volume One of Delaware & Hudson In Color, also from Morning Sun, has several photos of wooden cars still in passenger service.) One wooden boxcar and two converted for company sand service also appear. The one modern paint scheme I'm sorry not to find in the book is the billboard road name with double shield herald applied in yellow to 50 ft. PS-1 boxcars wholly painted – not just partially repainted – in the Nile green color the Reading had used. I saw at least one such car at Worcester, MA, in the summer of 1977; I saw at least two along the Northeast Corridor in the next year or two. They may have been among the handsomest cars the D&H ever painted, which is really saying something! I just hope I can find my notes showing the cars' numbers; I could kick myself for misplacing them! I could also kick myself for not having sent the authors one particular slide that my wife took at the mine in Tahawus, since it shows one yellow ilmenite hopper brighter and shinier than the one shown in the book, coupled to one far dirtier than any shown there. Ilmenite is very dirty stuff. It did not, however, burn the paint off the cars that hauled it. That happened, rather, to cars that were loaded at Tahawus with freshly sintered magnetite iron ore, a useful secondary product which was indeed hot when loaded. See Richard Sanders Allen's article on the line north of North Creek, ``Better Late Than Never'', in the January 1959 issue of Trains, which was also reprinted in the June 1962 BLHS Bulletin. This is the classic illustrated history of the D&H, first published in 1967. The original printing included one color photograph in addition to the frontispiece (the same painting by the late Manville B. Wakefield that graced the front of the jacket); some later printings had only the frontispiece in color. Some corrections to the locomotive rosters were made in later printings. The text was never updated and therefore doesn't go beyond 1967 - it mentions the arrival of the half-fluted streamlined passenger cars from the Rio Grande, but not the acquisition pf the PA's from the Santa Fe at the end of that year. by Ed Crist with John Krause, featuring photography by Robert F. Collins & Jim Shaughnessy. A wide format paper back with great black and white steam locos. Many photos of the Challengers and Northerns working hard on the D&H. History of the D&H roundhouse at Oneonta, New York. This book is an excellent source of building diagrams, track diagrams and photographs of the many stages in the life of the Oneonta Roundhouse. The book starts with the history of the Albany and Susquehanna and the site selection for the new roundhouse in the Oneonta area and progresses through the many upgrades the roundhouse saw in its long and illustrious career on the D&H. 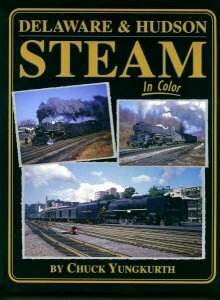 Excellent for color pictures of late steam and early Diesel locomotives on the D&H. This book covers the D&H from 1946 to 1967, RS3's and RS11's are shown in the lightning-stripe scheme, but the PA's do not appear. There are more fine color photos of D&H steam in action than most of us ever suspected had been taken. Few photos of freight cars are included, but modelers can still learn a great deal from this book. This book picks up where the first left off. It covers the D&H from 1966 to 1984. Excellent photographs of the PA's, Sharks, and the big six axel units making their runs on the D&H. A wide-format paperback, ably traces the road's history from the beginning of Buck Dumaine's presidency in 1967 through Bruce Sterzing's forced departure and replacement by Selig Altschul in 1977. Except for the cover, all photos are in black and white. The text is very useful. William J. Young, a resident of Starrucca, Pa., close to the Delaware & Hudson's Pennsylvania Division, who has long been a noted railfan, photographer, and publisher, chronicled the story of the D&H's PA's from their acquisition to their rebuilding by Morrison-Knudsen and use on the Adirondack. The book is a paperback with a color photo on the cover and many fine black and white ones inside. The text is based on an essay by Karl Zimmermann. In 1978 Norman E. Anderson of Morrison-Knudsen in Boise, Idaho, and Chris MacDermott, then the Assistant Chief Mechanical Officer for the D&H, put together PA4 Locomotive (note the omission of the usual hyphen), a hardback that combines a splendid selection of black and white photos with coverage of M-K's rebuilding of the PA's that should satisfy even the most technically sophisticated reader. 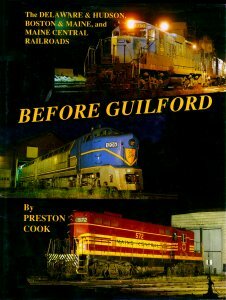 Better known as "Before Guilford", this book covers the D&H, the Boston & Maine, and Maine Central Railroads just before being acquired by Guilford. A hardbound collection of color photos, most featuring locomotives. A number of shots show power from the three roads being pooled both before and after Guilford acquired them all. 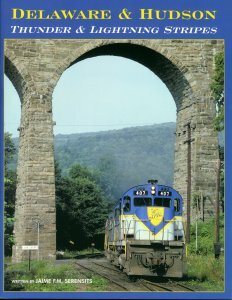 This book provides good coverage of the D&H, the Boston & Maine, and Maine Central Railroads from 1984 to 1988. The photos are mixed color and black and white covering a painful time for many fans of the D&H and the other lines taken over by GTI. A thorough recent history of the D&H, roughly from the formation of Conrail to the line's bankruptcy after is was cast off by Guilford. It's in hard covers and features both color and black and white photos. The chapter on D&H diesel locomotives is truly excellent. Softcover book with Black and White photos from Harold K. Vollrath of some very unique locomotives on the D&H. 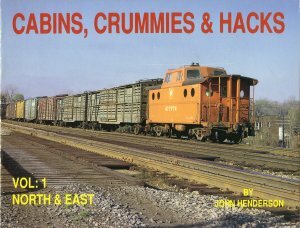 This book has several excellent photographs of D&H Cabooses. 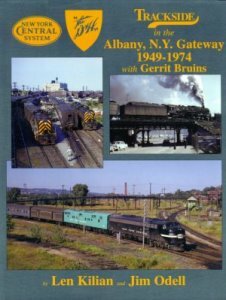 This is a photo album, mostly in color, covering the D&H and other lines that have run trains in the last few decades in and around Binghamton. The book proves that it's possible to take excellent photos in that area in spite of its supposedly gray and rainy weather. A mass of information on the D&H Mainline has been accumulated since Where did the Tracks Go (1985) and Railroads of the Adirondacks: A History (1996) were published. Enough material is available now to warrant a new chapter. . . . A great deal of detail is available on the Main Line for several reasons. It is a main line with heavy traffic and many branches. It has been in service for many years: 160 into Whitehall and 133 through Westport, for example, as of this 2008 writing. Many changes have occurred during this long period. Many industries have risen, peaked, and declined. In addition, there has been a number of relocations creating a complex history: examples are the Port Henry tunnels, the Bulwagga Bay trestle, a shift from Mooers Junction to Rouses Point, and the junctions with both the Ausable and Chateaugay Branches. Construction was complex, too: the line into the iron mines at Mineville did not initiate in Whitehall but in Leicester, Vermont. The Ausable line had been planned to be on the Main Line but became only a branch. The first railroad into Plattsburgh came not from Albany but from Montreal. The segment from Whitehall to Rouses Point was chosen for inclusion in this atlas for two reasons. First, the railroad itself is organized into operational divisions, one of these being the Champlain Division from Whitehall (actually, from Lake Station, just north of Whitehall) to Rouses Point. Built northward from Albany, the line terminated near Whitehall for 25 years before being extended northward to Plattsburgh and Montreal. Second, inclusion of detail south of Whitehall and in Quebec would have made this volume unwieldy. This is a work on the Adirondacks, and the bulk of the trackage should be in the Adirondacks. The segment on the Main Line from Port Kent to Rouses Point is not geologically in the Adirondacks, but is so tied in with branches into the Adirondacks that it is included. Publisher: The Chauncy Press ©1985. A well written history of the D&H with maps of the Oneonta Area. Well worth searching for a copy.